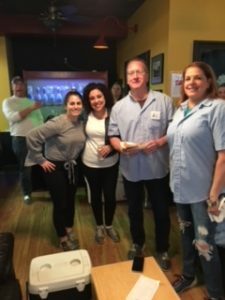 PITTSBURGH, PA – April 18, 2018 – Leech Tishman Fuscaldo & Lampl (“Leech Tishman”) is pleased to announce its fundraising efforts for the 2018 Big Brothers Big Sisters of Greater Pittsburgh (“BBBS”) Bowl for Kids’ Sake fundraising campaign, an annual fundraising initiative hosted by and in support of BBBS. Leech Tishman raised more funds than any other law firm in Greater Pittsburgh, collecting over $10,000 through a series of fundraising events this spring. 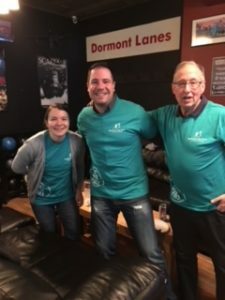 Starting on March 22, 2018, Bowl for Kids’ Sake hosted six bowling events in March and April to support BBBS. 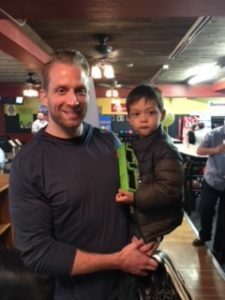 The final event was held on Sunday, April 8, at the “Brunch & Bowl” at Princess Lanes Bowling Alley. Steve added, “Leech Tishman employees—partners, associates, and staff—have supported this organization not just through fundraising, but by acting as ‘Bigs’ and ‘Littles,’ as well. One of the firm’s founders, Ted Tishman, was a Little Brother through BBBS; our attorneys and staff continue to work with the agency, inspired by the firm leadership’s example.” Steve estimates that, to date, the firm has raised more than $100,000 since it first became involved with BBBS. Background: Kenneth C. Foltz, Sr.. Foreground, from left to right: Nicole Chiodo, Alan G. Towner, Christine Graff. Associate John R. Whipkey (left). 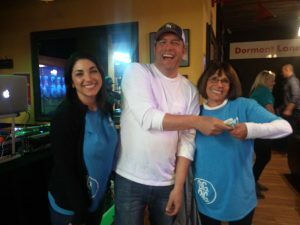 Partner Kenneth C. Foltz Sr. (center) won the 50/50 raffle on March 27 and donated his winnings back to BBBS. Bowl for Kids’ Sake (BFKS), the region’s largest charity bowling event, is a fun-filled day of bowling, games, excitement, and an opportunity for everyone in our community join together to make a difference in the lives of at-risk youth. Bowl for Kids’ Sake is Big Brothers Big Sisters’ largest national fundraiser, raising over $20 million annually for children in need across the country. Learn more about Bowl for Kids’ Sake here: https://www.bbbs.org/bowl/. Proceeds benefit Big Brothers Big Sisters of Greater Pittsburgh’s one-to-one mentoring programs serving more than 1,500 children in Allegheny, Washington and Greene Counties.